Retrieved from the WayBack machine and rehosted. This page is only up for historical purposes now. See code on GitHub for modern code. Also see this post for discussion about Sage with newer versions of Linux. adom-sage-0.9.1.msi (392 KB) - If you already have Windows Installer on your computer (for example, if you're running Windows 2000 or Windows XP), you should be able to save download time by only downloading this MSI setup package. adom-sage-0.9.1.zip (3,734 KB) - If the MSI package doesn't work, download this complete installer instead. ADOM Sage requires that the Linux version of ADOM be installed in the same directory for it to work. The ADOM Sage setup program will download the Linux version of ADOM 1.1.1 if you wish. If the setup program fails to work, or if you'd prefer to do it manually, click here for instructions. If you want to use saved games and high scores from a previous installation of ADOM, please make sure to install ADOM Sage to the directory where your old version of ADOM is installed. The DOS version of ADOM, ADOM Sage, and the Linux version of ADOM can exist in the same directory without any ill effects. If you downloaded the source, run make. Copy adom-sage and adom-sage.so to your directory containing adom. Run adom-sage instead of adom. If your screen display is messed up, please see the section on Graphics in the README file. If you have any questions, comments, or suggestions concerning ADOM Sage, please contact me. Any feedback is greatly appreciated! 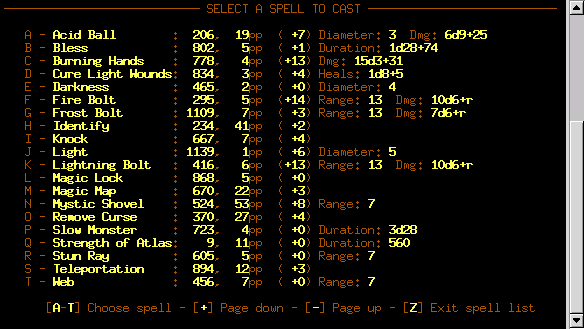 Spell and mindcraft screens now display range, damage, and duration. All of these options can be separately enabled or disabled. Additionally, ADOM Sage for Windows runs ADOM as a native Windows program, which means that it should run much better under Windows 2000 or Windows XP. Click here for a description of how ADOM Sage works. I am not affiliated with ADOM or with Thomas Biskup in any way. Please do not send Thomas bug reports based off of bugs encountered while playing ADOM through ADOM Sage. There's a pretty good chance that the bug is actually in ADOM Sage; please confirm that the bug exists when playing ADOM without the Sage before submitting it to Thomas. Please do not send RFEs (requests for enhancement) to Thomas based off of features in ADOM Sage. Most of these features have already been RFE'd. 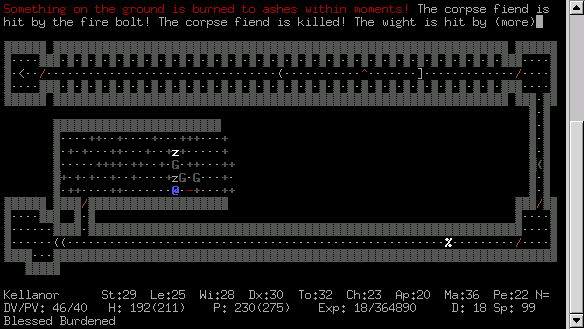 If you want to submit an RFE base off of a feature in ADOM Sage anyway, please at least first submit it for discussion to the rec.games.roguelike.adom newsgroup. The Official ADOM Website - Get the game here. ADOM Guidebook - Vast amounts of information on ADOM.